The San Diego Chargers take on the Kansas City Chiefs on Sunday, September 11, 2016 at Arrowhead Stadium. The opening line for this game has Kansas City as 7 point favorites and the over/under was set at 44.5. Last season the Chargers were 8-8-0 against the spread and their over/under record was 6-10-0. The Chiefs had an over/under record of 9-8-1 and they were 9-9-0 against the spread. San Diego scored 20 points per game on offense last season, which ranked 26th in the NFL. In the passing department, they averaged 28 passes on 42 attempts for a 67% percent completion percentage last season. They threw for a total of 287 yards per game through the air as well, which ranked them 5th in the league. The Chargers ran for an average of 85 yards per game on 25 attempts for an average of 3.4 yards per carry. That ranked them 31st in the NFL. They also ran 69 plays per contest and averaged 5.4 yards per play for an average of 372 yards per game, ranking their offense 9th overall last season. The Chargers averaged 22 first downs per game which ranked them 6th in the league. They accumulated 58.9 penalty yards per game via 7.3 penalties, which ranked 20th in the NFL. San Diego allowed 237 passing yards per game, ranking 14th in the league, and they allowed 25 points per contest on defense, which ranked 21st. They gave up 21 completions on 32 attempts per game for a completion percentage of 66%. The Chargers allowed 125 rushing yards per game on 26 carries for a 4.8 average per play, which ranked their rush defense 27th in the NFL. San Diego allowed 362 total yards per game including 6 yards per play, which ranked their overall defense 20th in terms of yards per game. They forced 1.3 turnovers per contest and got flagged for 7.5 penalties for 61 yards per game, ranking them 29th among all teams in the league. Kansas City averaged 25 points per game last season on offense, which ranked them 9th in the NFL. In the passing department, they completed 19 passes per game on 30 attempts for a 63% percent completion percentage. They threw for 203 yards through the air per game last year, ranking them 30th. The Chiefs ran for an average of 128 yards per game on 27 attempts for an average of 4.7 yards per carry last season, which ranked them 6th on the ground. They also ran 60 plays per game and averaged 5.5 yards per play for a total of 331 yards per game, ranking them 27th in the league on offense. 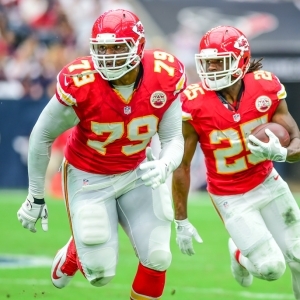 The Chiefs got an average of 19 first downs per game, which ranked 22nd. They averaged 53.9 penalty yards per game via 6.3 penalties, ranking them 11th in the NFL. Kansas City allowed an average of 231 passing yards yards per game, which ranked 9th in the league. Their defense overall allowed 18 points per contest, which had them ranked 3rd. They gave up 22 completions on 38 attempts for a completion percentage of 58% per game. The Chiefs allowed 98 rushing yards per contest on 24 carries for a 4.1 average per rush, ranking their overall rush defense 8th in the NFL. Kansas City allowed 329 total yards per game for an average of 5.1 yards per play, which ranked 7th in the league. They forced 1.8 turnovers per contest and 6.7 penalties for 55.2 yards in each contest, ranking 9th. Philip Rivers finished his last game of last season with 228 yards through the air for San Diego. He completed 21 passes out of 35 attempts for a 60% completion percentage. Donald Brown led the Chargers in rushing with 81 yards. He averaged 4 yards per carry on his 21 rushing attempts for the game. Tyrell Williams was the team leader in receiving with a total of 90 yards and 2 receptions. He finished the game with an average of 45 yards per reception. As a team in that game San Diego got a total of 15 first downs by way of 5 rushing, 8 passing, and 2 by penalty. They ran 67 total plays for 317 yards for the game. The Chargers ran for 110 yards on 29 attempts. Alex D. Smith finished the playoff loss to the Patriots with 246 yards through the air for Kansas City. He completed 29 passes out of 50 attempts for a 58% completion percentage. Charcandrick West led the Chiefs in rushing with 61 yards. He averaged 4 yards per carry on his 17 rushing attempts for the game. Jason Avant was the team leader in receiving with a total of 69 yards and 4 receptions. He finished the game with an average of 17 yards per reception. Kansas City got a total of 27 first downs by way of 10 rushing, 14 passing, and 3 by penalty. They ran 83 total plays for 378 yards for the game. The Chiefs ran for 135 yards on 32 attempts.